Developers also nearly turned it into a train depot. 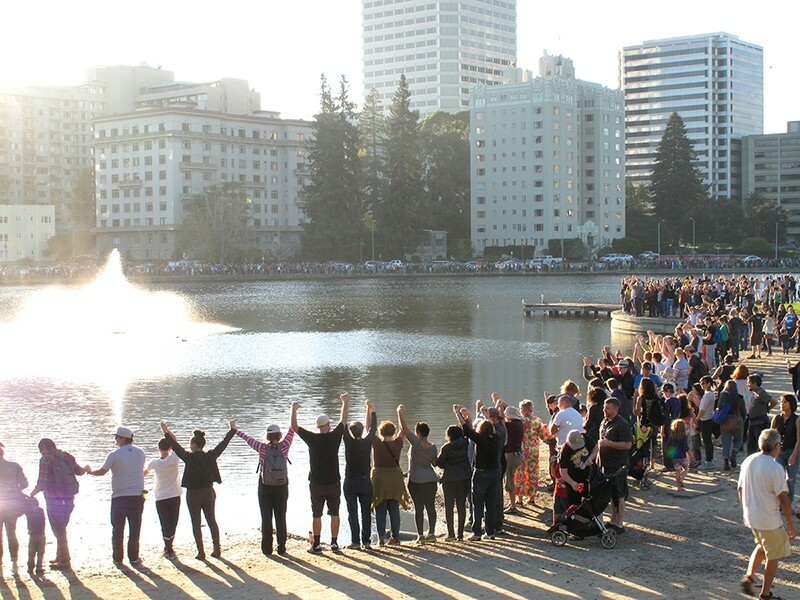 Before activists held hands around Lake Merritt, it was a destination for feces. The kooky inventor strapped two 14-foot metal canoes under a bike and rigged a propeller to its engine. He imagined the military would be interested in his contraption. The generals weren’t, but Frey’s bike was certainly of interest to Oaklanders that watched him rip around Lake Merritt on a sunny afternoon in 1912. Lake Merritt began not as lake, but as a slough connected to the Bay. Tidal flows through its natural channel purified the brackish water. Wildlife was plentiful. Recognizing this natural beauty, in 1869 the state deemed it the nation’s first wildlife refuge. But Oakland — founded by scurrilous real estate hucksters — was growing. From the earliest days, the lake was used as a sewer for offal and feces piped in from nearby subdivisions. Imagine the smell in 1897, when 10,000 members of the Christian Endeavor, an evangelical youth movement, picnicked by the lake. But the stank has never stopped people from gathering on its edges. Lake Merritt’s centrality happened in spite of the best-laid plans of the city’s engineers and industrialists. In 1899, dredging along the eastern shore began. Mud from the bottom was used to fill marshes that became city parks. The terrain around Lake Merritt is largely artificial, lifted over the years with sediment, or from nearby construction sites, as was the case in 1907, when the “bankers syndicate hotel” broke ground. Dirt from the excavated lot — today’s senior housing known as the Hotel Oakland — filled part of Lakeside Park. In 1912, Mayor Frank Mott had to issue a $25 reward against duck poachers. In 1932, Oaklanders learned how global their bird sanctuary had become when migratory mallards, widgeons, and spoontails tagged by the U.S. Biological Survey at Lake Merritt were shot by hunters in Alaska. Even though the cleansing tides were impeded as early as 1869 with Samuel Merritt’s first dam at 12th Street, the lake remained a swimming hole for several more decades, despite a 1912 ban on bathing. According to one newspaper clipping from 1920, there was even an Airedale dog that would paddle across Lake Merritt “on average three or four times a week,” because he couldn’t be bothered to trot the extra two miles around. And the lake’s mysterious weirdness always persisted. Columbus Day, for example, was celebrated in Oakland with a re-enactment of the “discovery” of the Americas, symbolized by a mock landing of the Italians three ships in Adams Point followed by the planting of a twelve-foot-tall cross in the ground and much sword-waiving. Some long-lost cove was rumored to contain buried treasure. According to Dewitt Jones, one historian of the lake, a man told Oakland’s parks board that two convicts at San Quentin whispered to him directions to find the loot. He even drew up a map. The gold or jewels was, of course, never recovered, the site buried with dredged muck and forgotten. There were many times the lake was almost ruined with one or another scheme of progress or profit. As early as 1891, the Southern Pacific Rail Road proposed filling in the lake and turning it into the city’s West Coast train depot. In 1930, a Posey Tube-like highway under the lake was proposed. Unwilling to let bad ideas die, a “viaquadrome” four lane bridge was proposed in 1938. But the only thing that ever really ruined Lake Merritt was all the dirt dumped in the channel between 12th Street and the I-880, which impeded water flow and resulted in the “Lake of 1,000 Smells” nickname. That’s changing now, thanks to Measure DD’s millions that are being spent to restore the channel and other parts of the lake. Eventually, the channel to the Bay will be completely reopened, bringing back long-lost aquatic life. But while the stink might subside, Oakland will keep Lake Merritt funky and strange.